One of PPA's mission is to campaign for the reform of the current (and inadequate!) U.S. Copyright Law. Our current system does little to protect professional photographers from damages when their work is used without their permission. And this makes no sense as the copyright system is supposed to protect copyright owners like you! Often times, 'a picture is worth a thousand words' so we created some cartoons to illustrate this cockamamie system. 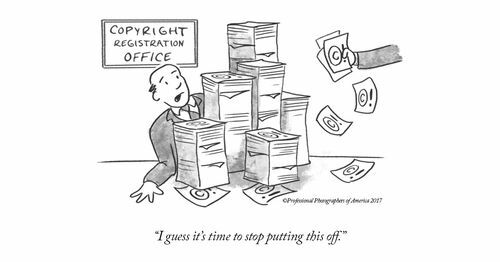 The idea behind these illustrations is two-fold: (1) to share something you'll relate to and (2) give you something you can share with your clients and fellow photographers to convey the inequity in copyright law. You can download both Copyright infringement illustrations here (2 sizes). Consider sharing them on social media today! To learn more about what PPA is doing to change copyright law by pushing for a Copyright Small Claims system, visit PPA's advocacy page. And if you'd like to see progress made with copyright protection, please join the group of photographers who are joining in solidarity for copyright change, the Copyright Action Team, to show your support and know how and when to make your voice heard in Congress! Help make a difference and add your name today: PPA.com/Grassroots!